Logistics is the key to the smooth and seamless running of a variety of businesses. The process ensures efficiency in terms of space, cost, and customer service, keeping businesses at the forefront of competition and innovation. 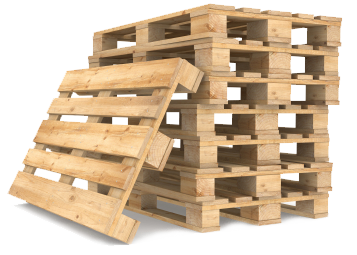 Wooden pallets have been a reliable and essential component of effective business for a number of years. Within a wide variety of industries, professionals such as distributors, retailers, manufacturers and transporters all agree that wooden pallets offer a range of storage and transportation solutions that provide maximum business impact with the minimum of effort. Despite all the innovations and new trends within industry, pallets remain one of the most widely used — and widely praised — features of the industry. Wooden pallets are well known to be one of the most cost-effective and reliable means of storing and transporting products locally, nationally and all over the world. For all their uses, they are often sustainable and cost-effective to produce. Their durability means that they have uses in a wide range of transporting and storage solutions and can help ensure the safe arrival of a wide variety of valuable goods. The solid, linear design of the wooden pallet also makes many of them stackable, meaning that space can be maximised within warehouses and businesses and on the go during transit. Even companies that are relatively short on space can often dramatically increase their capacity by making use of stackable pallets. Customers both at home and abroad have come to expect a higher standard of service than ever. With the globalisation of shopping and deliveries as a result of the e-commerce market, goods may now have to be transported rapidly across large distances. In spite of the difficulties this might entail, customers expect and are entitled to a pristine product that meets their needs and appears brand new. Pallets have been favoured by transporters in particular for their durable, protective structure that ensures products are held safely and securely throughout the delivery process. The use of pallets is a feature that many businesses have in common, regardless of their specific industry. They serve a crucial role in the chain of supply and demand and are key to ensuring the safe storage, distribution, transport and arrival of stock. Recent research and industry discussion have shown that the effectiveness of a business’s pallet system can have far-reaching consequences for the efficiency and effectiveness of the business overall. Businesses with a well-managed pallet system regularly out-perform those without one. Making an intelligent choice in terms of the size and structure of the pallets used can have an impact on some of the business’s most important daily processes. Safety and loading and unloading time are some of the most significant factors, along with overall delivery time and efficiency of storage. With the right choice of pallet system, businesses can help protect against the unnecessary loss of time, products, and profit caused by inferior or unsuitable systems.